As the owner of Peerman Capital Management, Bill reviews each client's investment history, analyzes needs and situations, and makes investment decisions. He helps clients articulate a financial objective, personal investment style, and risk tolerance. Then, based on his knowledge of the market and the client's short- and long-term goals, he helps the client use this information to establish an investment strategy. With more than 33 years of experience in financial consulting, he partnered with Commonwealth Financial Network® and started Peerman Capital Management in 2009. Bill is motivated by the idea of helping people. He, his brother, and a group of friends established Mobile Loaves & Fishes in Nashville in 2007 after hearing a radio interview from Austin, Texas, with the founder, Alan Graham. With five years of a good relationship with Mobile Loaves & Fishes in Texas, they decided to establish their own local nonprofit in Nashville. The name of the new organization is The Nashville Food Project, and the mission to provide increased access to healthy foods in homeless and working poor communities across Davidson County remains the same. With more autonomy as a local entity, 100 percent of the money received stays in Nashville. It is truly a local nonprofit that uses local dollars and local volunteers to address local problems of hunger and poverty in the community. 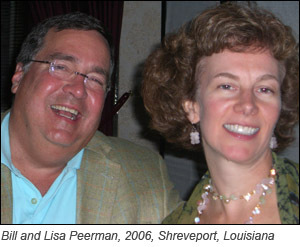 Bill has been married to his wife, Lisa, for 30 years; they have a Labrador retriever, Midnight Sally. Bill and Lisa love all types of music and spend time at their beach place on the Redneck Riviera in Panama City Beach, Florida. Christina has been Bill's assistant for 12 years. They both believe that the difference in their personalities is one of the qualities that makes their partnership so effective. Whereas Bill defines goals, Christina implements them. When Bill talks the language of investment management, Christina translates for clients. Christina handles all service and operational issues, and she considers customer service her top priority. She once spent an afternoon at a client's home, combing through old statements to determine the cost basis for some securities they had sold before becoming Peerman clients. She helped a couple set up Internet access to their accounts on the common computers at their retirement home. She even went to the Social Security office once to help a client file for benefits. When clients call Peerman and cannot reach Bill, they know Christina can answer their questions—or find the answers. Christina's life motto, from her father, is "Everything in moderation. Nothing in excess." She considers her work-life balance crucial and organizes her work so that she can devote her undivided attention to her family at home. 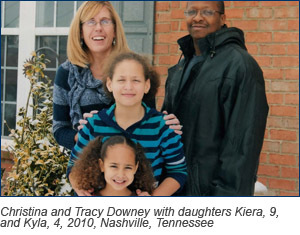 Christina and her husband, Tracy, have two girls, Kiera and Kyla. Christina enjoys sports, reading, playing the piano, and playing cards and games.